Parting is All know of Heaven and Parting il All We need of Hell (2 verses of Emily Dickinson). 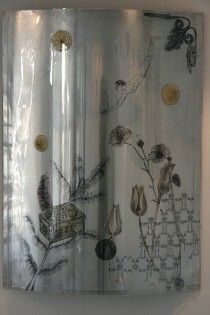 Are each composed by four plexiglass panels with drawings on paper, mounted on curved plexiglass. The combination of these 4 curved shapes creates side views that highlight separately particular linked. Behind there are strips of LEDs that show the different levels of card processing and duplication of materials. Along some panels are developed the openwork points that mark words and musical notes as bright spots to decipher. They are 2 aluminium panels composed by retrieved printing plates which I superimposed drawings on acetate and mounted on a curved plexiglass with the same system of lighting panels. Diver - aluminium and plexiglass, 70 x 100 cm.